Ny fisherman love music too! Re: Ny fisherman love music too! I'd love to hear that whole album! I was lucky enough yesterday to discover an incredible band at the Colorscape Chenango Arts Festival. The Adam Ezra Group from Boston. here's a video from YouTube. Watch it and if you like it, watch more. We met him on our way out of the festival and he's a real gentleman. a Greatful Dead kinda band. And it's all free music! There's 120+ of the greatest world class jewelers, craftsmen and women that I've ever seen. Various kinds of food and free live music all day. If you can't go this year, go next year. It's just that good. Look for my friends Don and Cindy Meixner of Old Erie Crafters. Don's a world class silversmith. Dug - that group is good. Had the pleasure of meeting them many moons ago, and they were all very pleasant. A nice change from most of the “younger” music groups I have met. I agree zwiggles...if it wasn't a 360+ mile round trip, I go again today! Hey Dom! Did you get your tickets yet? 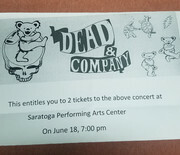 I saw on the news that they went on sale for Dead & Co. at SPAC.